As the largest of the all existing temples in China, the Temple of Heaven was the place where the emperors of the Ming and Qing dynasties worshiped heaven and prayed for good harvests. The construction of the Temple of Heaven was completed in the 18th year of the Yongle reign period of the Ming Dynasty (1420). Its main structures include the Hall of Prayer for Good Harvests, the Imperial Vault of Heaven and the Circular Mound Altar. The Hall of Prayer for Good Harvests is a lofty, round structure supported by 28 wooden pillars, with a coneshaped deep blue-tile roof crowned with a gilded knob. The Imperial Vault of Heaven is surrounded by a circular wall, known as Echo Wall. If a person whispers close to the wall at any point, the voice can be heard distinctly at any other point along the wall. 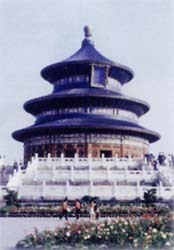 The Temple of Heaven can be reached by bus Nos. 6, 15, 20, 39 and 43, and trolley bus Nos. 106 and 116.